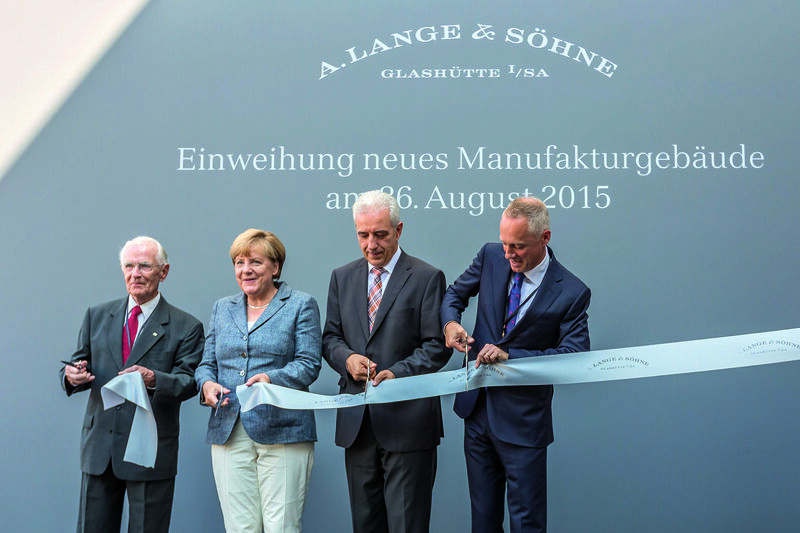 After the ground breaking ceremony of A. Lange & Söhne‘s manufactory in September 2012, the new complex was formally inaugurated this August 26 in Glashütte by Dr. Angela Merkel and Saxony’s Prime Minister Stanislaw Tillich. As part of a select group of press members, we had the chance to witness, in close proximity to the German Chancellor, the opening of the new structure which provides a highly advanced and optimized working environment. Watch our video coverage and read more below. A product of 3 years of construction, the new 5400m2, 25m high building houses watchmaking, part production, manual work on components and logistics departments. Lange CEO Wilhelm Schmid explained the reasons behind the infrastructure expansion: “The new building is a response to employment growth in recent years and represents an investment in the manufactory’s future.” Viewed as an urban landmark at the southern gateway to Glashütte with its bright and clearly structured facade, the new structure blends harmoniously with its historic architectural surroundings and offers a modern, energy-efficient system ensuring appealing surroundings and ideal working conditions. The brand seems confident this will further enhance the quality of its watches and optimize the production processes while minimizing the ecological footprint and resource consumption by being a CO2-free facility. The manufactory is A. Lange & Söhne’s biggest investment ever, a double-digit amount in millions of euros, but will definitely render a good return on investment in the long run.